Rabies - protects against this deadly viral disease which affects your pup's central nervous system. Usually there will be three sets of combination vaccinations (a shot that protects against more than one disease) given at 3 week intervals. The puppy shots timeline that most vet's traditionally recommend starts vaccinations at around 8 weeks. A second shot is given at 11 weeks and then the third at 14. The Rabies vaccination is given at around 16 weeks. 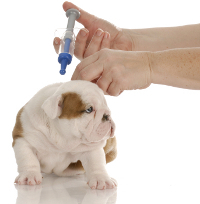 Giving puppy immunizations is good, but giving them at the right time is essential if you want them to work! Very young puppies have a certain amount of natural immunity that they get from their mothers milk, but that begins to diminish somewhere between 5 and 8 weeks of age. If a puppy is vaccinated while he still has a significant level of maternal antibodies in his bloodstream, the vaccine won't be effective. Some studies have indicated that at 6 weeks old only 25% of puppies vaccinated respond to a vaccine by producing antibodies. By 18 weeks that figure has risen to 95%. All puppies need to have the core shots to protect them from the most common dog illnesses, but there are also other diseases/conditions that some pups may be at risk of catching. These can also be prevented by vaccination, but it's important to know that not all puppies need (or should have) these. Sometimes it depends on the part of the country (or world) that you live in. Other times the activities your pup will take part in or where he'll spend a lot of his time is the key. Certain vaccines are often grouped together and give as one shot. The most common would be the 3-in-1 shot for Distemper, Adenovirus and Parvo. These are all CORE vaccines. Then there's a 5-in-1 option which also includes protection against Leptospirosis and Canine Parainfluenza. A 7-in-1 puppy shot option is available which gives additional protection against other strains of Adenovirus and Leptopsirosis. If your pup will be boarded, kenneled, attend dog training classes or be 'out-and-about' a lot (which hopefully he/she will to get those valuable puppy socialization experiences ) you need to have the Bordatella vaccine given. There are two options for administering the Bordatella vaccine - a 'shot' or nasal drops. I prefer my puppies/dogs to get the nasal drop option as it works faster and doesn't need to be repeated in 4 weeks the way the shot does. If your dog isn't a hugely social animal, then annual boosters are enough. BUT if he travels a lot, goes to doggie day care, is boarded or at the dog park regularly then having the vaccine given twice a year is recommended. NOT RECOMMENDED TO GIVE 7 WAY AS ALLERGIC REACTIONS ARE COMMON, WHICH CAN BE FATAL , ESPECIALLY TO A YOUNG PUP.